Dirty paws, coat or behind? No problem! 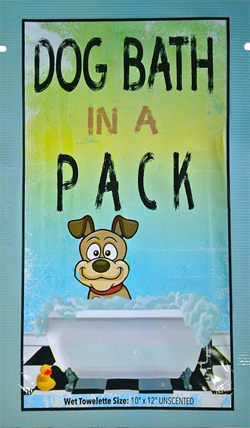 Introducing Dog Bath in a Pack, an easy way to get your dog clean and fresh, when soap and water are not available. "Just what we needed to keep our fur baby smelling clean. My dog has super short hair and in between baths he needs this grooming wipe. He sleeps with us so it so important to keep him clean. The package of twelve individual wipes arrived in great condition and in excellent packaging. They are easy to carry in a purse and the dog seem to like it too. Fast easy and convenient. Keeps everyone happy!"